Mumbai Matters: SEZ who, SEZ when? Today's Times of India has a huge article on page 2 on the Navi Mumbai and Maha Mumbai Special Economic Zones (SEZ). The Navi Mumbai SEZ also has its own website, but I could't track the Maha Mumbai SEZ site. In any case, as this HT article informs us, both are integrated. The article also provides a map (given below) of the location of these SEZs. I couldn't locate the link to the TOI article, but here are some interesting numbers I got from it. Incidentally, the article also informs us that Jurong Town Planners, the same people that designed Singapore, will be "crafting the master plan" (for the NMSEZ). Another data point from the article - Shenzhen China is the poster boy of SEZ. It has attracted US$27.53bn worth of FDI as against India's total FDI of US$34bn over the comparable period. In case you're interested in SEZs in India, do visit the Indian SEZ website (which probably will have to be worked upon if we have any hope of inviting serious foreign participation). 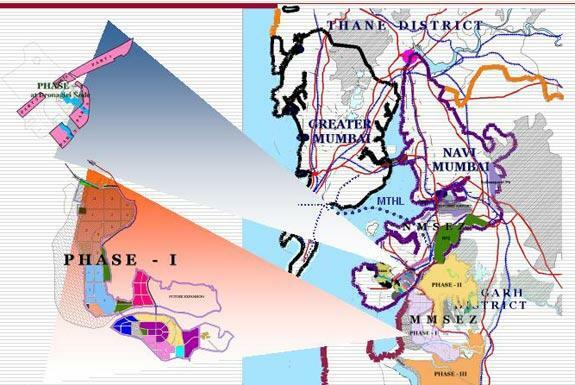 Yes, you will groan about the fact that the Navi Mumbai SEZ is an old idea that's never really taken off. Check out this article, which was also gung-ho as far back as Aug-2003. But nothing's happened. Probably the development of the Mumbai Trans Harbour Link and the new international airport hold the key to the whole project taking off. As will the investment of giants like Reliance, which is backing this project. I'm still researching this topic and will get back as and when I can get more gyan. Nevertheless, yet again I find myself hoping for this city. Even if hope is a four-letter word. There is hope. Probably ten years (five?) down the line, things could look different. Black Friday 1993. Never forget.